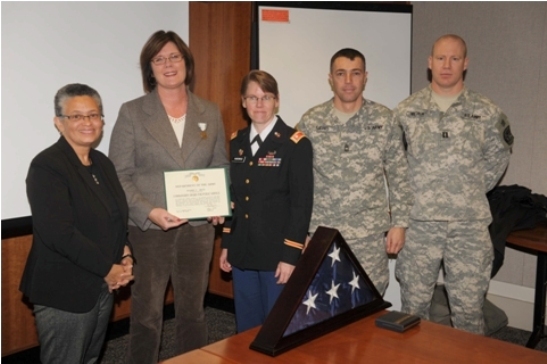 Eileen Jevis, public relations manager at University College of Syracuse University, was recently awarded the Commander’s Award for Public Service by the U.S. Army. The award recognizes exceptional public service that contributes significantly to the accomplishment of the mission of an Army activity, command or staff agency. Jevis coordinated the University’s Veterans Day Ceremony on campus on Nov. 11, an event that included a major program in SU’s Hendricks Chapel with Whitman School of Management Dean Melvin Stith delivering the keynote address. This was followed by a wreath and flag ceremony on the Quad, and a luncheon for 250 people. A special guest at the event was well-known country singer Michael Peterson, who sang the National Anthem and his popular solo “You Could Hear a Pin Drop” in Hendricks Chapel. The Commander’s Award is the fourth highest honor the United States Department of the Army can bestow upon a civilian, ranking directly below the Outstanding Civilian Service Award. It can only be approved by a commander with the rank of colonel and above. Lt. Col. Susan Hardwick, commander of the Army ROTC program at SU, nominated Jevis for the award. “Eileen’s leadership in executing this first ever Veterans Day Ceremony at Syracuse University created an awareness about veterans on campus and allowed the University to honor those who serve in the military,” says Hardwick.”The ceremony was extremely well done, honoring past and present veterans of Syracuse University in a very respectful, dignified and moving way. Eileen’s passion, energy, and work ethic in organizing this event were tremendous.” The award was approved and signed by Col. Glenn H. Goldman of the 2nd (Freedom) Brigade at Fort Dix, N.J.